Executing demanding tasks, day in and day out, takes a solid piece of hardware. Inter2Face carefully selects standard components to build a device that starts up from 0 - also after a power break - and goes straight to its application within 15 seconds. The right choice for unmanned installations! 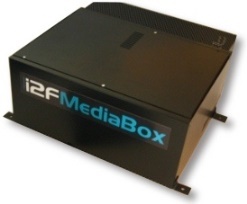 i2f MediaBox is equipped by default with i2f MediaBrick and i2f MediaEditor software. There are numerous options for small devices with low energy consumption and the capability of reproducing full HD video, even with an extra interactive layer! Thanks to our software, a small form factor i2f MediaBox can be optimized to cater for diverse applications. State of the art components chosen for the purpose and based on load balancing: defining exactly how much a device can cope with!